Take 2 parts husband and wife, 1 part Naples sourdough starter and 1 part self-belief. Add 1 wood-fired oven on wheels, a warm Bexhill evening and 50 kids untethered. Combine gently with a flexible spoon and knead regularly for 3 years. Turn out onto a well-worn village hall and enjoy with friends. If you asked a 17-year-old Andrea Bonotto what he’d be doing today, he probably would have said ‘working in the restaurant at my parent’s ‘otel’. Growing up next door to their hotel in Vicenza, north-eastern Italy, working for the family business seemed certain until his father sold it and Andrea was left wondering what to do. Low paying warehouse jobs, a transcontinental pilgrimage and a teaching degree later, he is back doing what he knows. “It would have been a lot cheaper if I went straight there”, he concedes with a smile. After a breakup, a holiday to Brisbane in 2001 seemed a good escape. At a pub, Andrea met Emily Lockton, and in 2006 the couple moved back to Bexhill, Emily’s hometown, to both attend university. When their son, Jack, was born in 2007, Emily quit her environmental science degree and started her own business sewing kids clothing and nappies, which she sold at markets. Andrea says that Emily is the organisational one, and she’s constantly coming up with new business ideas. So, with her encouragement and market experience, Andrea’s secret pizza dough recipe and $5,000, the two launched their trailer-towed, wood-fired oven pizza concept. 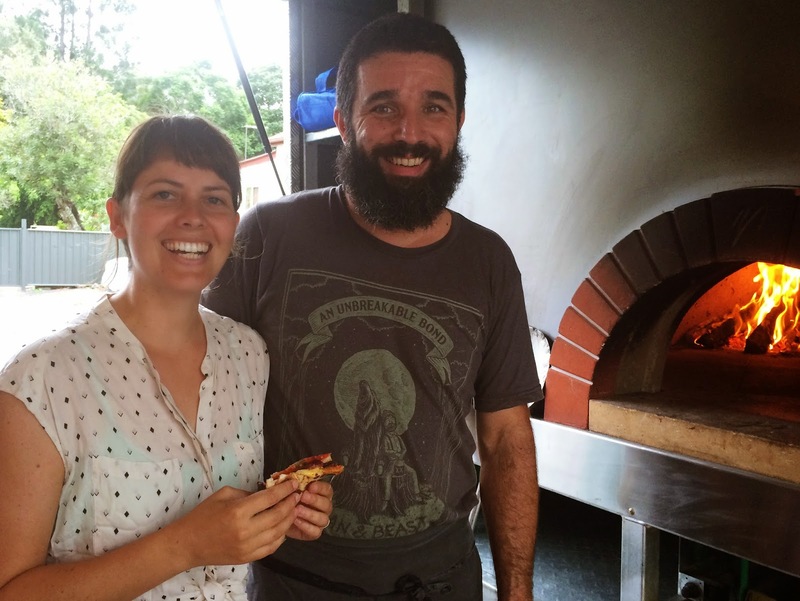 Initially selling at markets, Il Carretto began doing community pizza nights in Bexhill three years ago. “We said if we sell 20 pizzas we’ll be happy, ‘cause we just live down the road.” They sold out that first night. And the next. “It’s hard living and working together, but at the same time I wouldn’t have it any other way”, says Andrea. Being self-employed also allows them the flexibility to spend time with their two children, Jack, now 7, and Francesca, 4. Andrea is aware of what he’s left behind in order to build a life here. Naturally, he misses his family and his hometown, and there’s also Asiago, with its snow-covered mountains, where he holidayed for many years, and where Il Carretto’s pizza recipe comes from. Andrea is appreciative of the freedom and possibility that exists in Australia. “Here I have the opportunity to go to uni and have a family and buy a house at the same time”, he says, adding that the support of Emily’s family has been essential. There are some aspects of life here that still present a challenge, though. “I’m scared of the bush and the ocean”, laughs Andrea, hoping that some expeditions in their new camper trailer will soon help rectify that. The pizza nights in Bexhill and Clunes are now reassuringly busy each week. In a country where the town square is more food-court than pigeon-filled fountain, the community has embraced these unstructured, European-style get togethers. Little tribes of kids running around, adults relaxing on rugs, no separations of age or income. “You know, we only come and do the pizza. It’s what people make it”, says Andrea. “Bexhill pizza has become it’s own thing, it has it’s own life. Sometimes I think if I stopped doing the pizza there, people would still gather there and just bring their own stuff.” He grins as though that would be the ultimate validation of what he and Emily have been working on. Their efforts have been rewarded with friendship, which Andrea likens to an extended family. Enter your email address to get all my posts directly in your inbox. Straight from me to you! Camping with kids. Why do I even bother? Why I'm reclaiming the phrase: "You sound like your mother!" Observer, listener, writer, newspaper reader, mother, wife, gardener, list-maker, thinker, procrastinator, deadline-lover.